This discussion was created from comments split from: Multiple vaults on Android..
Angel, I agree with you but sadly the old models are going away in place of rental software. It bothers me too, but at some point we will need to realize this is the new model. And a word of caution on any Windows version updates. I had the paid version and it worked greatly. It informed me there was an update. So I installed it only to find out that it works in read only mode and requires a subscription WITH NO ADVANCED WARNING!!! Sorry Agilebits, but that is just wrong on so many levels. Would really like to know how I go back now. I was close to signing up for monthly, but that little trick has pushed me back to looking at alternatives again. Not cool. @MajorHavoc: Sorry, but you're just wrong there. The last release of 1Password for Windows you could have paid for was version 4. And there is nothing in that app to even tell you there is a new version. That was a very conscious decision to avoid thing thing you're accusing us of. The only way you would have gotten an update notice at all would be if you were running version 6, and you didn't buy a license for that. 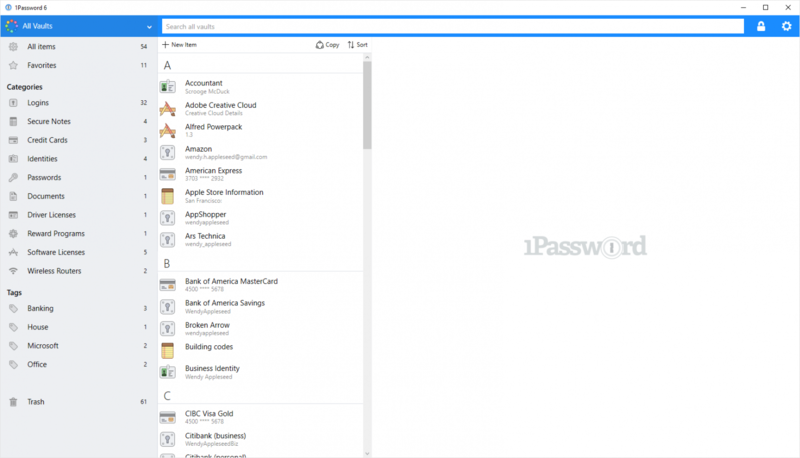 Unless you were already using it as part of a 1Password membership, it would have been read-only as well; it was designed only for 1Password accounts and never had the ability to write to local vaults (they were supported only for importing data). If you reinstall 1Password 4, you'll see that you won't be offered an update to the paid version 7 upgrade no matter how many times you check. I can certainly see being upset if you'd wanted to know about version 7 but didn't find out because we avoided pushing people to it because of exactly the thing you're complaining about. But I don't think it's fair to blame us for doing something we haven't. Ok, I believe you but in practice, not what I saw. I answered a dialog that told me I had an upgrade. I’ll go look at the version, but I though it was 4. Maybe that machine was still on 3 and upgraded to 4? I’ll check that machine tomorrow. Thank you. It was upsetting. But 1Password 4 doesn't know anything about our new Windows app. And the only release we have before that was 1Password for Windows version 1, which cannot even connect to our update server since we changed it years ago. Well, I am becoming senile. I see 1Password4 on that machine (4.6.262 to be exact) and thought I had 4 already, but maybe not. There used to be a web page where I could see old licenses, but I cannot find that anymore. The only place now seems to be https://my.1password.com and that is frozen (expected) and I can't find my old licenses there at all. And looking in my current vault, I just have this login here to the forum, and the other to the "my" account. So it is possible I only paid for 3 and it updated to 4 which is why it is not Read Only, but I would like to confirm that. Is there a way I can see my paid licenses still? Thanks, and sorry for the bad info. Want me to delete that message? @MajorHavoc: No worries. To be fair, it's pretty confusing since we've had different license types, places to purchase them, different version numbers, etc. over the years, and now a "new" business model. That's on us. I'm sorry for the trouble. I'm not sure exactly what you're looking for as far as a web page for old licenses. You may mean the "customer center" we got rid of long ago to avoid having any customer data potentially accessible on a public-facing website, since someone using a weak password (I know, I know, but nobody's perfect) could end up exposing information about themselves that way. We may have had that around the 1Password for Windows version 1 time frame, but I can't recall for sure. Definitely not with version 4 (there was no 2 or 3) or later though. Or you may be thinking of the license email you would have received. Those were HTML-formatted, so technically a web page, and certainly it looks like a web page and I can see remembering it that way. You should still have that unless you deleted it (or switched accounts and didn't take the archive with you). You'd really just need the license key (and you probably have that stored in 1Password), since that what was used in older versions of the Windows app. I'm not sure that necessarily clears everything up. Hopefully it helps, but if you have any other questions let me know and we'll go from there. I hope you don't mind, but I'll split this tangent off into a new discussion in the Windows category since we've diverged far from the original Android conversation. @MajorHavoc: To circle back a bit, version numbers and licensing can be confusing under even the best of circumstances. We know that, and it's another one of the big things we wanted to simplify with 1Password memberships. People shouldn't have to worry about this stuff if they don't want to, either way. Our versioning has been all over the place, and I'm sure that has played a part in the difficulty you've had trying to navigate this. It might seem silly to apologize about version numbers, but this is what we've wraught: I'm sorry that decisions we made in this area years ago are still giving your grief in 2019! This past year, with the release of version 7 across all platforms (okay, I guess it's been a bit more than a year now...time flies!) we've made a conscious effort to reign that in too. We can't retroactively address that for decisions we've made in the past, but we are making an effort to stay more consistent going forward. Version numbers sort of don't matter in the grand scheme of things, but they can cause unnecessary headaches in some case. So every little bit helps. Thanks for all that. I did some digging, and I found version 4.6.2.626 AND version 7.3.657 on the machine as the same time. And of course, the newer one seems take precedence, so in the browser, I am seeing a version 7 of 1Password, and that is locked Read Only. But I can open both versions at the same time, and see my version 4 is working fine IF I look for it. I have no idea how I got 7 on this machine, because I really only respond to update messages, but maybe I clicked on something in an email. Sorry for my confusion, I really thought I had lost me old copy. The funny thing is installing ver 7 replaced the shortcuts on the desktop, and in the browsers, but version 4 was still in the apps folder and runs great. Wow, that was certainly confusing. Thanks for walking me through this brenty. Sorry about my misunderstanding of what happened. Oh, and thanks for moving this to a new thread. @MajorHavoc: WHile they can certainly both be installed, I don't recommend it since it will cause you trouble in the browser, with both of them trying to connect to it. Keeping only one will save you some frustration. Hmm. My best guess is that you installed 1Password 6 at some point in the past, maybe even just forgot about it, and it's been hanging around waiting for updates ever since. Version 6 would update directly to version 7 since all updates are included with the membership, and that's all version 6 supported. You're welcome, and again I'm really sorry for all of that. I can't change the past, but at least now we have a single app with sane version numbering that works with both licenses and memberships. Now I just have to figure out what happened! :-) Oh, and thanks for moving this to a new thread.